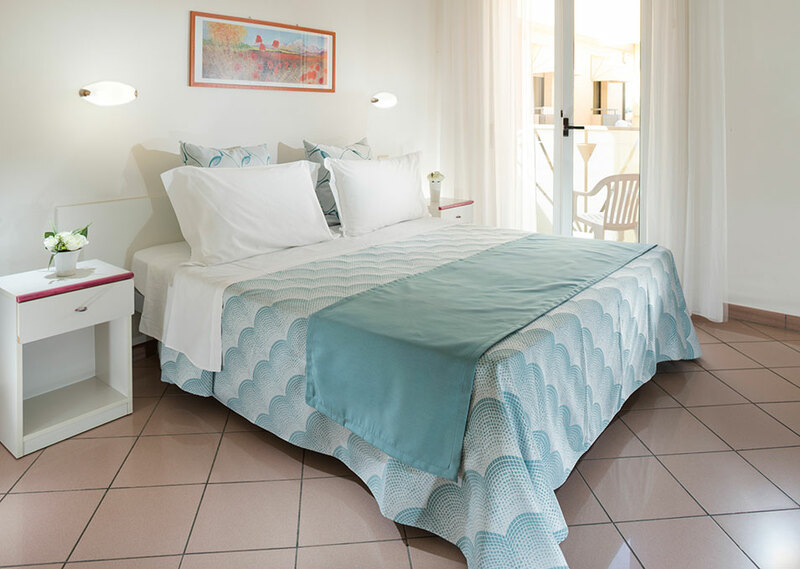 Hotel Radar is a 3 star hotel in Marina Centro of Rimini, at 70 meters from the beach and a few minutes from the sidewalk of Viale Vespucci, rich of shops, restaurants, pizzerias and clubs. Our hotel overlooks Viale Regina Elena, the classic destination of the summer walk, parallel to the seafront. It's the ideal hotel for families. In addition to booking your beach umbrella from us, at convenient prices, with the inexpensive beach service, you can reach the sea with your children in less than 2 minutes on foot. In addition, at Bagno 55 you will find BoaBay, the floating park to entertain your children while you relax in peace on the sand - minimum age 6 years, under 140 cm only if accompanied by an adult. You just need a comfortable swimsuit and sunscreen to start the BoaBay experience. Your children can play safely on slides, tunnels, platforms, trampolines and on an inflatable iceberg to climb. All rooms are furnished with simplicity and good taste and are well lit by the light coming from the balcony. We have single, double and twin rooms, as well as family rooms for up to 4 people, with bunk beds. 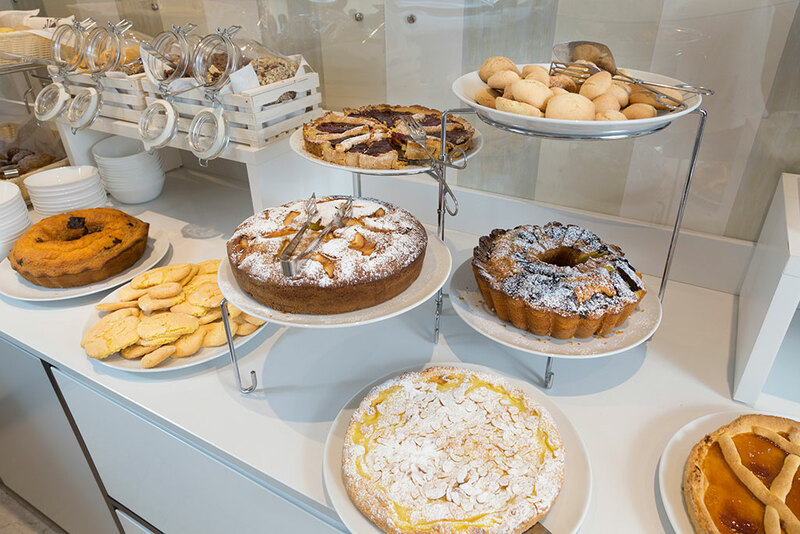 The breakfast includes a rich buffet, sweet and savory, because we want to make your day start off well, every day. A few steps from the hotel you can find restaurants and pizzerias among the most popular in the city: with our coupons, you can have lunch and dinner at reduced prices. First, however, we suggest you try a cocktail prepared in our internal bar: you can sip it in total relaxation on the veranda. Do you want to have fun with your children? No problem! Here you can find tickets for Mirabilandia and other theme parks on the coast. Are you in town for work? Don't worry: Hotel Radar is open for events in the city and is 3 km from the Palacongressi and 6 km from Rimini Fiera. A meeting room is also available in the hotel: it can host up to 30 people and is complete with video projector, screen and basic amplification. If you arrive by car, remember to book a parking spot: we have 7 reserved parking spaces, available on request, for a fee. Single, double and twin rooms are available, as well as family rooms for up to 4 people. All rooms are furnished with simplicity and good taste and are well lit by natural light coming from the balcony, which gives spaciousness to the spaces. Each room has free Wi-Fi, independent air conditioning, a safe, balcony, private bathroom with a shower cabin and hairdryer. Some double rooms have a sea view. You can choose between single, double and twin, or rooms for 4 people, with double bed and bunk bed. Is the first thing you want to see in the morning the green and blue hue of the waves? Or the sparkle of the sun's rays reflected on the water? 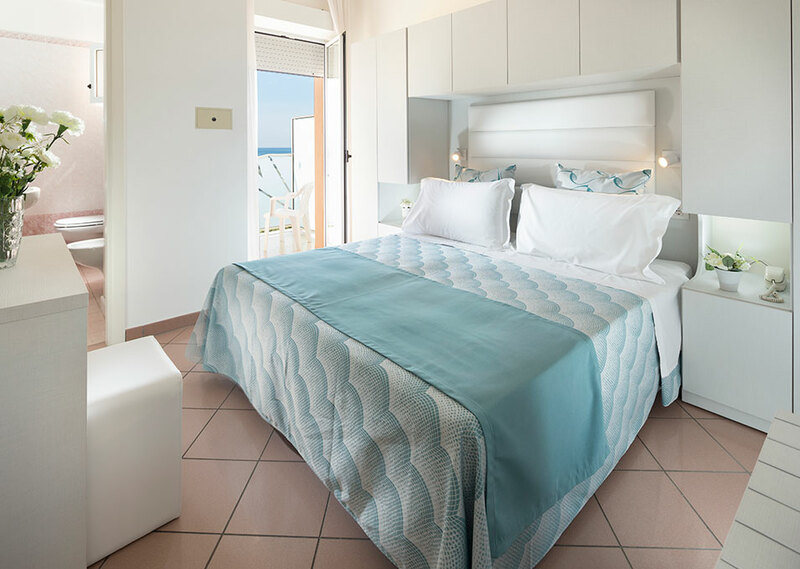 You can choose one of the double rooms with sea view, the solution preferred by couples.